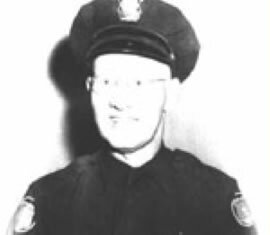 Officer Harold A. Peterson, Sr. Officer Peterson was killed in a traffic accident. At approximately 10 a.m., the 54-year-old victim was patrolling on his three-wheel motorcycle. As he entered the intersection of 1300 South and 1300 East, a vehicle driven by an elderly man turned in front of him. The collision knocked Officer Peterson from his motorcycle, dragged him more than 30 feet, and pinned him beneath the vehicle. He died of severe head trauma. Officer Peterson was married and the father of a son, who later became a Salt Lake City P.D. officer. He is buried Wasatch Lawn Memorial Park. His bronze name plaque is sponsored by Salt Lake City Police Mutual Aid Association.